Chinese human rights activist Huang Yan, who was granted refugee status by the United Nations, has been granted leave to stay in Taiwan for three months after entering the island seeking political asylum. Huang, 48, arrived at Taoyuan International Airport in Taipei on a China Airlines flight from Jakarta, Indonesia at 8:40 pm on Tuesday. She was held at the airport until Wednesday afternoon, when she was released. Taiwan has yet to legislate a refugee law. Huang’s visa was sponsored by Yang Sen-hong and Chiu Ling-yao, respectively the president and secretary-general of the Taiwan Association for China Human Rights NGO. Huang Yan. File Photo: RFA/Taiwan Association for China Human Rights. 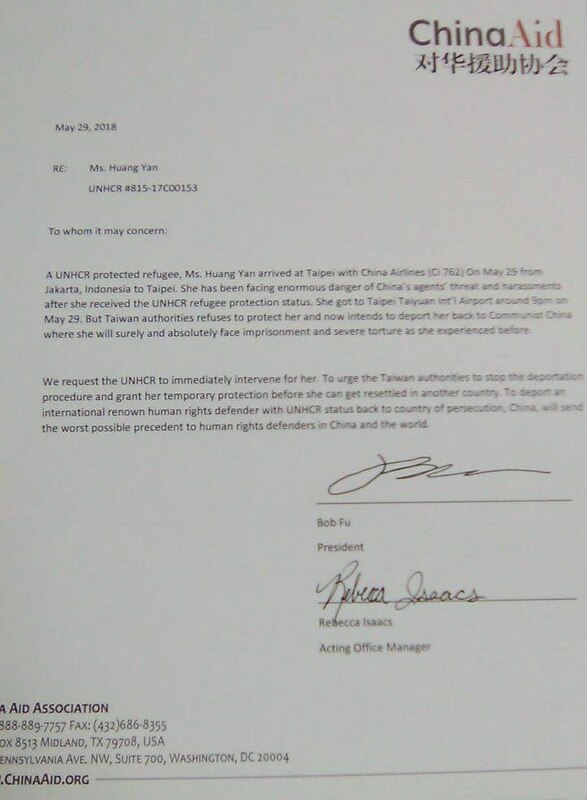 On Tuesday, US-based NGO China Aid submitted written appeals to the United Nations High Commissioner for Refugees (UNHCR), urging Taiwanese authorities to grant Huang temporary protection before she can be resettled in another country. “To deport an international renown[ed] human right defender with UNHCR status back to [the] country of persecution, China, will send the worst possible precedent to human rights defenders in China and the world,” wrote Bob Fu, president of China Aid. 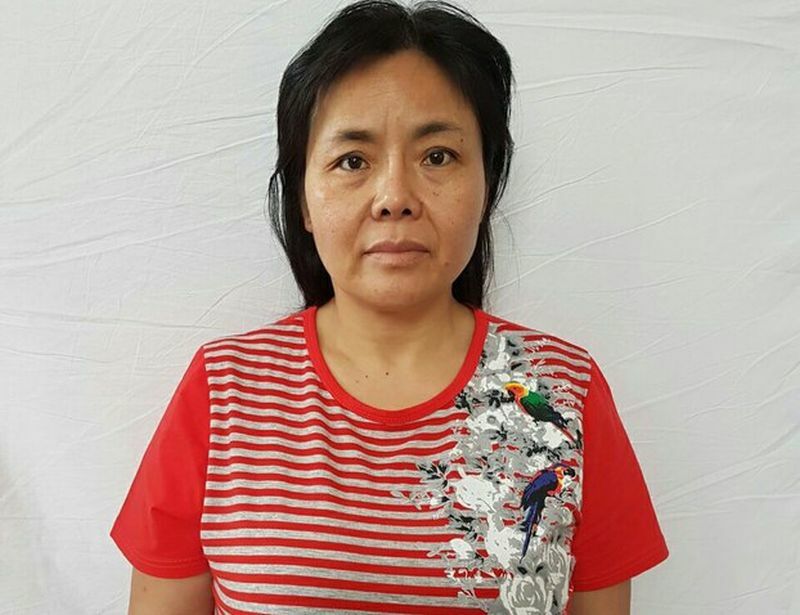 Huang claimed UNHCR refugee status in 2016 owing to deteriorating health and denial of medical treatment in police custody. Letter from US-based NGO China Aid to United Nations High Commissioner for Refugees. Photo: Supplied. Fu told HKFP in a telephone interview on Wednesday that Huang cannot go back to Thailand or Indonesia, where she previously stayed, because her visas in those countries had expired. “She has no other way out [but to go to Taiwan],” he said. Huang became involved in human rights activism after meeting prominent Chinese human rights lawyer Gao Zhisheng in 2003. She then advocated for Gao’s release after he was detained three years later. According to a submission to the United Nations by the NGO Chinese Human Rights Defenders, Huang was subjected to “numerous arbitrary detentions, house arrest, and disappearance.” She also suffered miscarriages on three occasions due to brutality by state agents, and eventually developed ovarian cancer, according to the NGO. 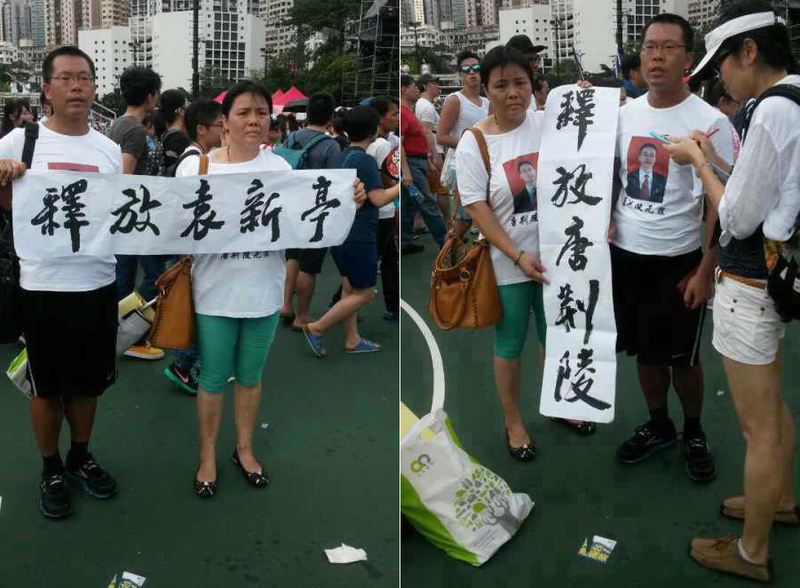 Huang Yan (in green shorts) protesting in Hong Kong for the release of detained Chinese lawyers and activists. File Photo: Stand News. 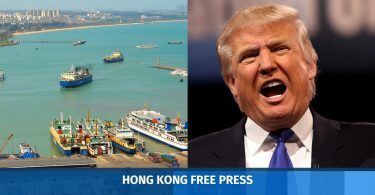 But Huang carried on her advocacy efforts, including taking trips to Hong Kong to demand freedom for prominent activists and lawyers detained in China. 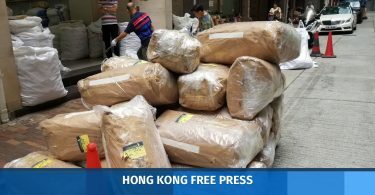 HKFP has contacted Taiwan’s National Immigration Agency for comment.